B. B. King (b. 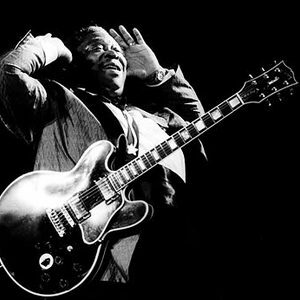 1925) is a U.S. blues guitarist and songwriter. He is among the most respected electric guitarists; Rolling Stone magazine ranked him third in its list of the hundred greatest guitarists of all time. Born Riley B. King on the 16th September 1925 in Itta Bena, Mississippi, he began broadcasting his music live on a Memphis radio station called WDIA. At first, he used the name The Peptikon Boy on air, which later was changed to The Beale Street Blues Boy, and then further shortened to just Blues Boy or B.B. Born Riley B. King on the 16th September 1925 in Itta Bena, Mississippi, he began broadcasting his music live on a Memphis radio station called WDIA. At first, he used the name The Peptikon Boy on air, which later was changed to The Beale Street Blues Boy, and then further shortened to just Blues Boy or B.B.